In this lesson, we will learn how to describe refraction as the speed and direction change of light when passing between media of different densities. A light ray traveling in water of refractive index 1.3 is incident on the flat surface of a plastic block with a refractive index of 1.6, traveling through the block at an angle of 45 degrees from the line normal to the surface. At what angle from the line normal to the surface does the incident ray strike the block? Answer to the nearest degree. A light ray traveling in water of refractive index 1.3 is incident on the flat surface of a plastic block with a refractive index of 1.7, hitting the surface at an angle of 45 degrees from the line normal to the surface. At what angle from the line normal to the surface does the refracted ray in the block travel? Answer to the nearest degree. A light ray traveling in water with a refractive index of 1.3 is incident on a flat boundary with air, hitting the boundary at an angle of 45 degrees from the line normal to the boundary. At what angle from the line normal to the boundary does the refracted ray in the air travel? Answer to the nearest degree. A light ray traveling in air is incident on the flat surface of a plastic block with a refractive index of 1.5, hitting the surface at an angle of 45 degrees from the line normal to it. 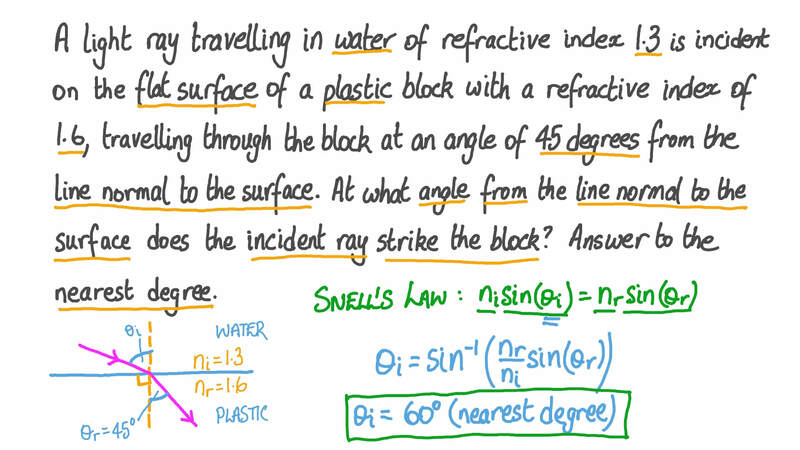 At what angle from the line normal to the surface does the refracted ray in the block travel? Answer to the nearest degree. A light ray traveling in air is incident on the flat surface of a plastic block, hitting the surface at an angle of 45 degrees from the line normal to it. The refracted ray in the block travels at an angle of 33 degrees to the line normal to the surface. What is the refractive index of the plastic? When a light ray passes from a medium into a different medium of lower density, does the speed of the ray increase, decrease, or not change? When a light ray passes from a medium into a different medium of higher density, does the speed of the ray increase, decrease, or not change? A light ray traveling in oil is incident on a flat boundary with air, hitting the boundary at an angle of 45 degrees from the line normal to the boundary. The refracted ray in the air travels at an angle of 58 degrees to the line normal to the boundary. What is the refractive index of the oil? Give your answer to one decimal place. A light ray passes from air into a different material that has a refractive index of 1.6. The light ray moves at 3 × 1 0 8 m/s in air. At what speed does the light ray move in the material? Give your answer to four significant figures. The diagram shows a light ray passing from air through a glass block. Which angle is the angle of refraction from air to glass? Which angle is the angle of incidence from glass to air? Which angle is the angle of incidence from air to glass? Which angle is the angle of refraction from glass to air? Which of the diagrams shows refraction of a light ray? A light ray traveling in water is incident on the flat surface of a glass block, hitting the surface at an angle of 45 degrees from the line normal to it. The refracted ray in the block travels at an angle of 37.8 degrees to the line normal to the surface. What is the refractive index of the glass? Use a value of 1.3 for the refractive index of water. Red, green, and indigo light waves pass from air into a different material that has a greater density. What is the ratio of the speed of the red light in air to that of the red light in the other material? Answer to two decimal places. What is the ratio of the speed of the green light in air to that of the green light in the other material? Answer to two decimal places. What is the ratio of the speed of the indigo light in air to that of the indigo light in the other material? Answer to two decimal places. Which of the three light waves will change direction by the largest angle when passing from air into the other material? White light passes from air into a glass prism. Which of the following diagrams most correctly shows the refraction of the red, green, and indigo parts of the white light? The diagram shows the wave fronts of a light wave passing from air into a different material. The light wave moves at 3 × 1 0 8 m/s in air. At what speed does the light wave move in the other material? Give your answer to three significant figures. A graph of an incident angle and a refracted angle is shown for a light ray moving through an object. Which of the points , , , , and most closely matches a correctly plotted point? A graph of the incident angle and the refracted angle is shown for a light ray moving through an object. Which of the points A, B, C, D, and E is closest to the correctly plotted position for an incident angle of 65 degrees? The diagram shows four identical light rays traveling through water and then passing through objects made of different materials. The materials of the objects all have different densities and light travels at different speeds in them. In which of the objects does light travel at the greatest speed? Which of the diagrams correctly shows refraction of a light ray, assuming that the substances the light ray moves through have different densities?